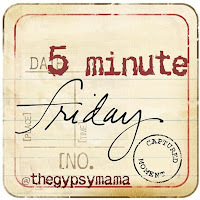 I’m grateful to have Five Minute Friday to get back into blogging, as I have been too ill to write for longer than this for the past two weeks. Last week I was privileged to witness baptisms in the sea. They all told their stories, their paths of finding God and life. It was a collection of different lives and journeys – tales of loneliness and being found; abandoned and gaining a family; sceptical and finding belief. They were so different, but the fragrance of Jesus wound its way around each story and I was struck again by the generous grace of God in reaching out to us. Then we watched them and cheered with them. They went down into the sea, saying goodbye to their old self, old habits, old life; rising up afresh, shocked with the cold and the exhilaration of the wet and the waves, hair messy and eyes open and mouths spluttering. There was such joy – on their faces, in our hands as we clapped them and our arms thrown up to God as we cried and praised. When did you last share your story of faith? Have you ever seen a baptism like this or been baptised? How did it feel? Is it a sin to be angry at God? I love the idea of a sea baptism! Probably the closest I have witnessed was a baptism in the Headwaters of the Mississippi River. That sounds like an awesome experience! The sea baptism was pretty cool too. Sounds amazing! Hope you recover quickly from the effort of going – but I bet it was worth it. I think the significance of water in religion is really interesting. In Judaism, we have the Mikva which is mainly used by women to purify themselves at a certain time of the month, but is also used for instance when people convert, or for other special occasions. Probably both from the same historical origin! p.s do you get my facebook messages at all? No pressure at all to reply, but just wondered! I’m so bad at replying to the facebook messages! I think i replied to the longer one, but not to the most recent one about your blog… sorry – I thought the blog looked great! I’d love to know more about Judaism – it’s really interesting. I feel like I should know a lot from the OT, but all the things you talk about sound so unfamiliar! I need educating! Is there baptism in Judaism? So thankful for that generous grace that looks the same on all circumstances and life choices. Lovely photo too. I wondered where you were last week. Sorry you were sick and glad you are on the mend. Have a great weekend. Thank you – and for your good wishes. Blessings! I love having the privalage of witnessing someone’s baptisim. It always brings me joy. I feel like I’m welcoming another brother or sister into my family. Thank you for sharing your wonderful experience with us. It was a great 5 minutes! 🙂 Praying you have a wonderful Friday. Yes – it really had that ‘family-feel’ about it! Thanks so much for stopping by. What a great story to go with the prompt! I enjoyed your description of the baptisms, as I have never seen one of this kind before. Thanks – it was a really awesome experience to be part of.